The five-day science festival was an interactive and activity-based platform for educating, celebrating and exploring science and technology with the aim of inducing the love of Science and Technology careers among youth and the general public. Around 20,000 grade 5 – 12 learners across Limpopo Province were targeted. School Governing Bodies, parents, graduates, general public and business leaders were also at the festival. 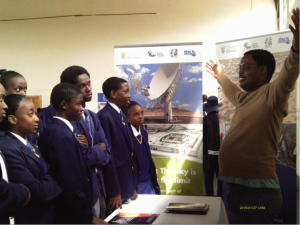 Mr Khutso Ngoasheng from the SKA South Africa’s Commissioning and Science Processing team was also present and delivered a lecture on the history of radio telescopes and explained what SKA is trying to achieve with MeerKAT. Provide skill development opportunities to the youth from the local communities surrounding the SKA core site. To date, SKA South Africa has provided 36 bursaries. The training programme is made up of four phases. The first is a theoretical course where the students attend lectures at the Kimberley Urban College. The second involves practical training and the third phase involves in-service training where the students are placed in a work environment for a period of 18-24 months. The final stage involves a trade test before they are able to obtain their qualification. 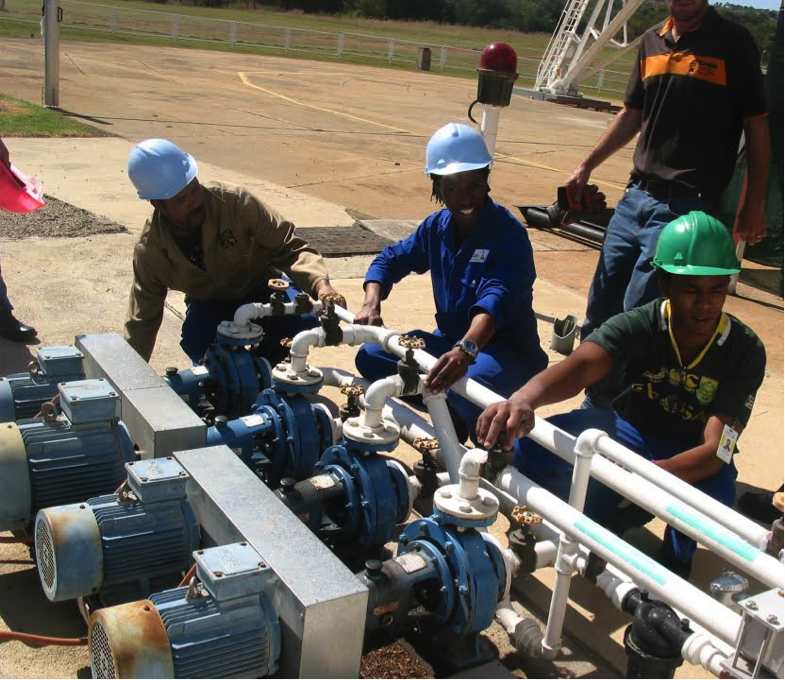 SKA South Africa has partenered with NECSA, JMC technical, Adcorp and other training centres where the students are able to complete the 3rd and 4th stages of the qualification. On the 28th of April, the 7 students placed at the South African Nuclear Energy Corporation (NECSA) visited HartRAO. 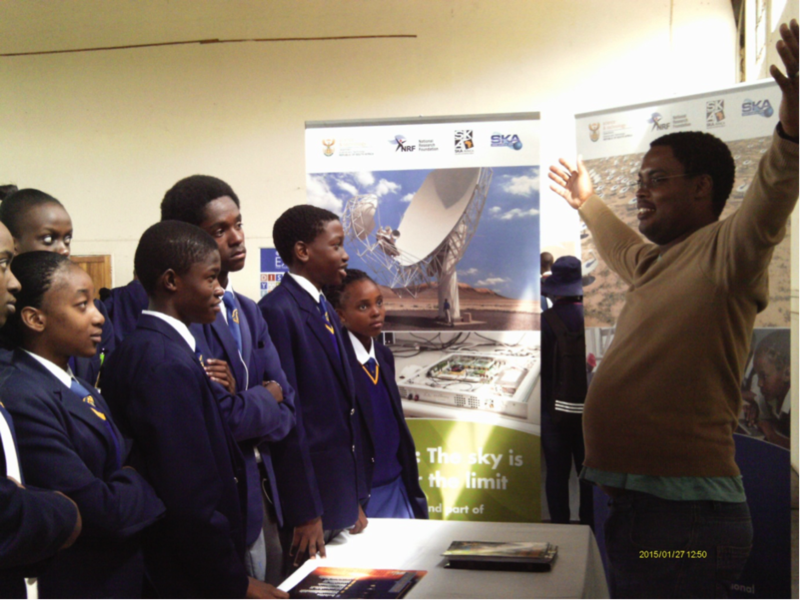 The excursion was aimed at raising their awareness of the radio astronomy landscape and they were exposed to presentations explaining VLBI, AVN and the concept of array telescopes. 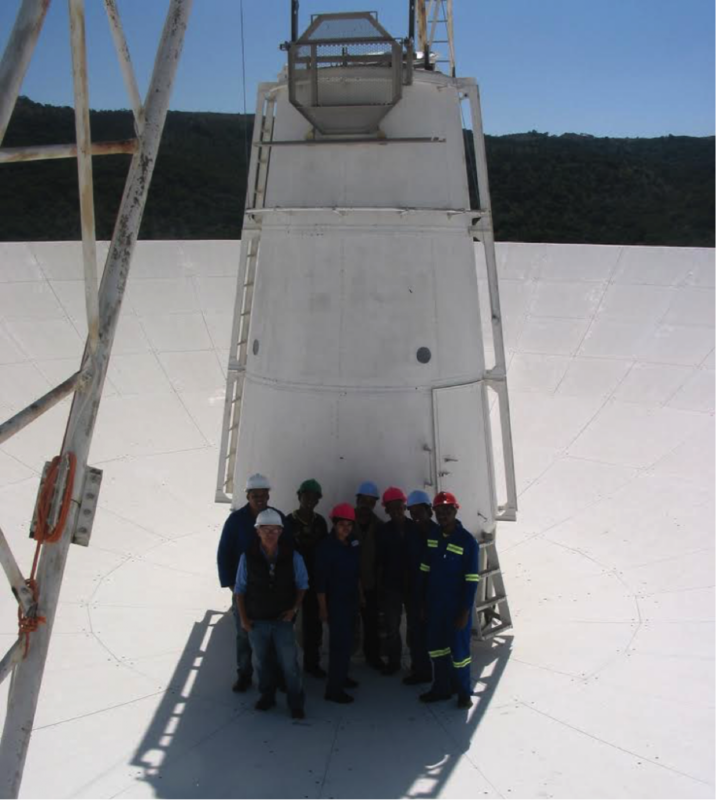 Outside of being given a tour of the facilities and technical workshops, the students ascended the 26m single-dish telescope. SKA South Africa hosted a workshop on pulsars at their offices in Cape Town in April, to bring together local pulsar communities and international researchers to discuss pulsar science using South African telescopes. About 50 people attended, half of them local and half international delegates, with discussions covering a range of topics related to MeerKAT and SKA pulsar science. Professor Aris Karastergiou, from UWC, Rhodes University and Oxford, said, “I was impressed by the number of South African scientists with an interest in pulsars and also by the announcement at the meeting of an exciting discovery of a fast radio burst by Jonathan Sievers“. Professor Sievers is a member of the University of KwaZulu-Natal’s Astrophysics and Cosmology Research Unit. Pulsars emit across a broad range of wavelengths. In the radio band they are bright from frequencies below 100 MHz, as observed by LOFAR, to the typical GHz frequencies of observation of the world’s largest single dish telescopes. The South African radio telescopes HartRAO and KAT-7 observe at these higher frequencies. The pulsars we know of today are located in our own galaxy and the Magellanic Clouds, so the southern hemisphere offers better views and the best opportunities for discovering new galactic sources. The MeerKAT and the SKA telescopes will increase by an order of magnitude for the known population of radio pulsars, discovering sources for the best tests of general relativity. New discoveries will help us gain a better understanding of the nature of matter in the interior of pulsars and of the physical properties of interstellar space. Specifically for the MeerKAT, the new plan for S-band receivers will help in conducting surveys toward the plane of our galaxy where interstellar material makes it difficult to find pulsars at lower frequencies. For the same reason these receivers can offer high-precision timing observations of known pulsars to complement the lower frequencies. Given the levels of engagement and exchange of knowledge the next workshop is already being planned, possibly together with the 2015 annual meeting of the International Pulsar Timing Array collaboration.